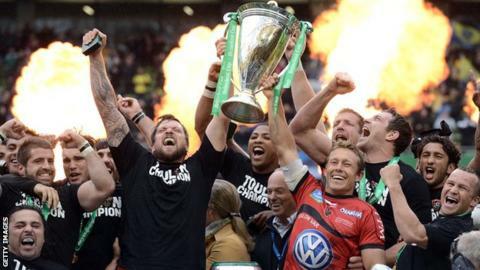 Next year's European Rugby Champions Cup qualification process has been changed due to a fixture clash. The original play-off plan for the 20th and final place in the competition has been scrapped, with only three clubs rather than four now involved. It means only one team from the Pro 12 - involving 12 clubs from Ireland, Italy, Scotland and Wales - will be in the play-offs. The Rugby Champions Cup replaces the Heineken Cup and begins in October. For the 2015/16 competition, two clubs in the Pro 12 were supposed to compete in a play-off against the teams finishing seventh in the English and French leagues. However, due to a clash with the French Top 14 season, the play-off will now only involve one team from the Pro 12. This will be the team that finishes eighth in the regular season, or more likely the highest-placed side not already qualified. They will face the seventh-placed Premiership club on the 23 May, with home advantage decided by a coin toss. The winner of that will host the seventh-placed side from the Top 14 the weekend after for a place in the Champions Cup. The other 19 places will be made up of six teams from the Premiership and the Top 14, and seven automatically qualifying from the Pro 12, although every country must be represented. The men who saved European rugby?